Maximize your drawer space with the Artisware Organizer- the perfect solution for drawer storage. With up to 9 compartments, this expandable tray provides a custom fit for your household needs. Whether you're storing cutlery in the kitchen, accessories in the bathroom or tools in the home office, the Artisware Organizer is as durable as it is functional, with easy-clean, water-resistant compartments, plus extra-deep sides with an additional 4.5" of expandable space. Made of eco-friendly bamboo, a natural and easily renewable resource, the Artisware Organizer is a beautiful way to simplify your home storage. PERFECT FOR STORAGE - Fits perfectly in almost all standard drawer sizes being 17.9" long, 2" deep, and ranging from 14" - 18.9" in width. 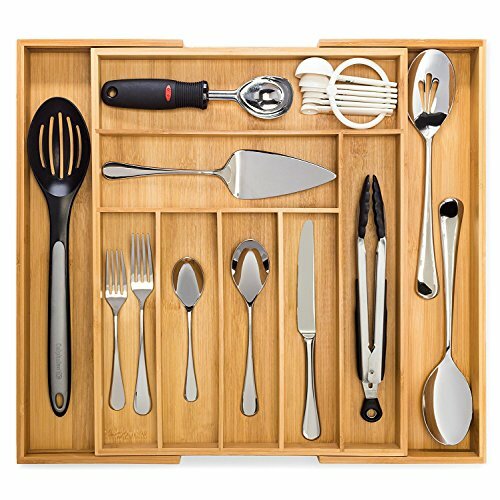 Easily store flatware, utensils and other kitchen gadgets. EXPANDABLE & PRACTICAL - Adjustable design with 7-9 compartments. Two expandable compartments with enough space for all your cutlery, flatware and silverware. BEAUTIFUL LOOK - Water-resistant eco-friendly bamboo that wipes down easily with a damp cloth. The Artisware makes everything look beautiful and better organized. It will match almost any decor. If you have any questions about this product by Artisware, contact us by completing and submitting the form below. If you are looking for a specif part number, please include it with your message.